Stripped of its layered percussion and mariachi horns, the song feels far more somber than celebratory, transforming its spirit of over-the-moon infatuation into something more like sadness. The video, lensed by Dan Newman, intersperses shots of Third Man’s packed Blue Room with close-ups on a scruffy and serious Misty. Misty also recently shared an outtake from this very same Third Man performance, in which he cuts “I Love You, Honeybear” short after realizing he’s begun his set with the wrong song. The Pure Comedy mastermind continues to tour in support of his magnum opus, sharing numerous live videos from those shows. 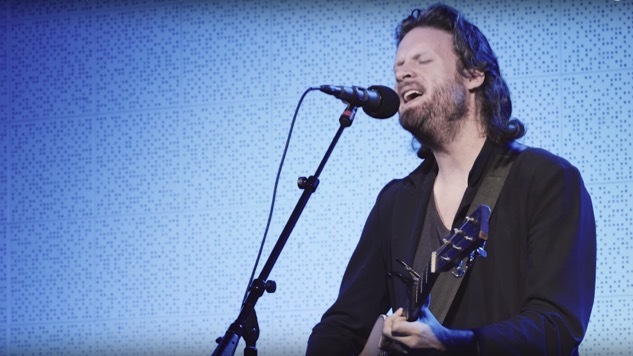 Watch Misty’s performance below, listen to his 2012 Daytrotter Session in the Paste Cloud player beneath that, and see how “Chateau Lobby #4 (in C for Two Virgins)” stacks up in our ranking of every Father John Misty song right here.